false shepherds, who have insinuated themselves here among unknowing Germans, become a disgrace. 2. that you leave your children unbaptized, if they are healthy, until the arrival of the church servant for whom you prayed to God; if your children suffer a serious illness or are in danger of dying, you may baptize them yourselves as fathers, or if a father feels too weak to do so he may ask one of the brothers to do it for him. 3. that you suspend the celebration of the holy eucharist until the arrival of a proper church servant and fortify your faith through the word alone. 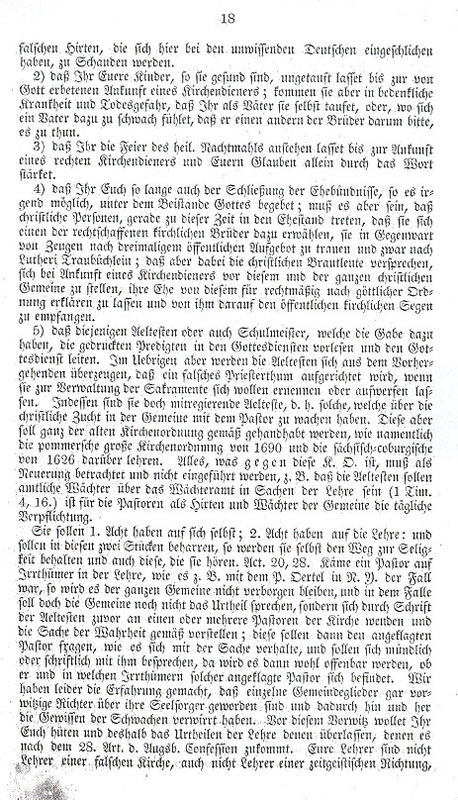 4. that, if it is at all possible, you refrain from the closing of marriage contracts until God's proper circumstances are at hand; it is necessary, before they enter the bonds of matrimony for Christian persons to select one of the properly chosen church brothers, pledge themselves in the presence of witnesses after three public announcements in accordance with Luther's booklet on marriage; upon the arrival of a church servant the couple takes their vows before him and the entire Christian community, their marriage is declared valid according to divine ordering and they receive an offical church blessing from the church servant. 5. that the elders or the school master, whoever has the gift, read the printed sermons in the church service and lead the service. However the elders must beware lest a false priesthood be initiated which would call for or institute itself for the administration of the sacraments. These elders are co-directors; that is they are those who maintain the vigil over church discilpine along with the pastor. 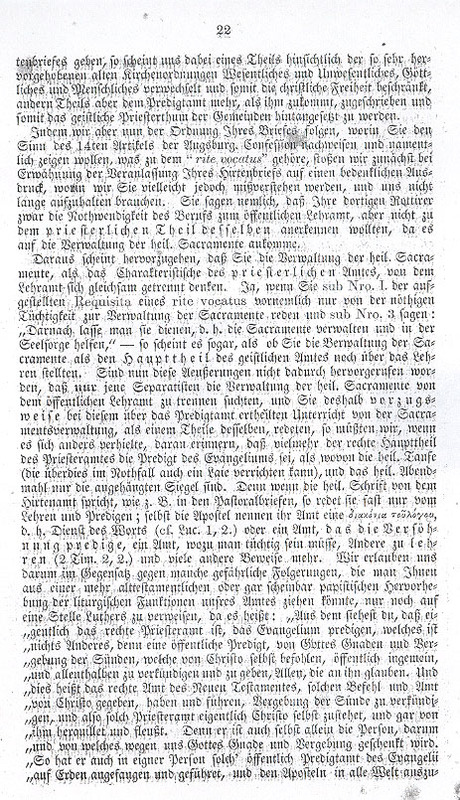 They shall always have the old church orders at hand, such as the Pomeranian Great Church Order of 1690 and the Saxony-Coburg Church Order of 1626. Everything, which is contrary to these church orders must be considered innovation and must not be introduced, for example, that elders should be official watchmen over the watchman of matters of teaching (1 Timothy 4, 16) when it is the daily responsibility of the pastors to act as shepherds and watchmen over the congregation. rather they are teachers of the true church, as is sufficiently well recognized. You may also set before them a solid profession of church teaching, indeed as deep a profession as you may understand it and as you have learned to believe, to teach and to preserve yourselves in righteous faith; thus you will be able to believe, preserve yourselves in righteous faith, and be sanctified. Hebrews 13, 17 and 18. Obey your teachers and follow them for they watch over your souls, as they have been given the right to do; it is not good for you if they do it with a smile rather than a sigh. Pray for us. It is our consolation that we have good consciences and we apply ourselves diligently to providing good service to all. It has also come to light that there are still some weak and disorganized souls among us, who have deserted the church assembly of congregations, because they think that one or other of their friends and countrymen have been unjustly treated in church discipline. Even if that were the case that would still not make the church false, for it remains the right and true church as long as God's word and the holy sacraments are pure. It thus follows that these people have not acted as Christians but as regional and worldly beings, leaving the church because they think one or other of their regional neighbors has received injustice. We are bound through God's command to the holy church of Jesus and not to our regional friends. All peoples, who come from any region and who fear God and do good, that is, who seek and love the true path to sanctity, are pleasing to him. This means they have been taken up into his church and therefore we should not ask whether someone is a regional neighbor but rather whether he is a member of the church according to God's heart. And if he has been our countryman and friend for thrity or fifty years but he became a despiser and blasphemer of the holy church, then in accordance with God's word we should shun such a misleading spirit even as he is warned once and for all or repeatedly (for in Christianity one did not refer to someone from Judea or Greece or any other province but rather a new being was created.) This shunning should not be done out of hatred but love so that he may be moved to examine himself by our loving distancing from him. But if we are easy going and show ourselves tolerant to such error we intensify the error in a misguided way and make ourselves participants in those sins. a) singing is much more edifying that reading. St. Paul didn't say, "He who is in good spirits reads psalms" but rather "sings psalms." If singing in church assemblies is much more edifying than mere reading then the church is doing what is right when if allows people to chant psalms or sing at the altar and even attach a singing "Amen." See 1 Corinthians 14, 16.
but a gesture of remembrance and confession as it was in the old church before the institution of the papacy. The crucifix or a picture of the crucified Christ is not an image to be prayed to or adored, rather an expression of public confession in the church as the crucified Christ is and will be painted in word and sacraments before the eyes and as he exists as the church's grounding, leader and hope. c) the lights stand at the altar because it was night and there was no sunshine when Christ advised and established the sacrament of the altar. Through this arranging of the altar a picture of the difficult, high priestly night of passion on Holy Thursday, followed by Good Friday, is painted before the eyes, in which the light of the world, God from God and light from light, Jesus Christ succumbed to the fear of death for us. Who is afraid of this? Or who scorns it? How could such a perpetual reminder not do our frivolous and forgetful hearts good? Therefore the church does rightly in having its arranged altar although it knows that ceremonies in themselves are neither helpful nor harmful to our sanctity, the light and the cross in themselves are neither helpful nor harmful to me, but the true practicing of such ceremonies, to which God has no objection, can be useful to the soul. May God, Our Lord grant that this brief and modest lesson be blessed and become a voice for the Lord's mercy, which provides enlightenment and admonition for many hearts. May the Father of mercy along with his loving son, Jesus Christ and the venerable Holy Spirit, who proceeds from both, be in your souls and may they preserve you in the covenant of the holy church unto eternal life. Amen. Dearly Beloved Ministerial Brother in Christ! your worthy houses and with your congregations, and we see this above all else as a great advancement of our current relationship and communality that, as we have learned from one of our own midst, soon it will be reciprocal and you, dear ministerial brother, will grant us the friendly offering of a visit in the upcoming year when it is possible. The loving God will certainly remove all obstacles along the way so you may go through with your plans, or if it will make things easier for you, we could send one of our neighboring ministerial brothers to take your place for a few weeks so you can make the journey, however then we would not all have the pleasure of making your personal acquaintance. Much could be discussed and consulted, which is difficult to put down in written correspondence. How important it would be to reach accord concerning the communal establishment of a teaching and education facility for future teachers of our congregations! 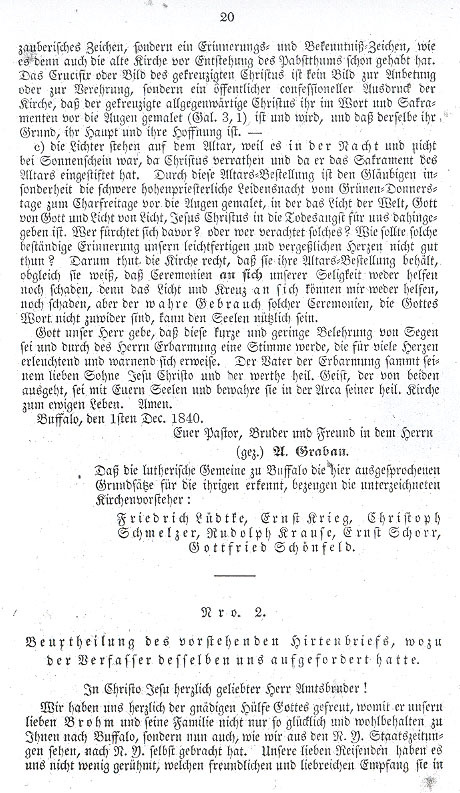 Next to the departure of our friend Brohm, it was this all important matter which prompted me and my brother in ministerial office, Gruber, to make the trip to St. Louis, where I now write this letter, to discuss matters with our beloved ministerial brother Walther and his congregation. Amid the recurrent deliberations, which we have held with Pastor Walther and his congregation, will of course be the mention of the expressed appeal from your last letter that under the current circumstances such an institution uniting yours and our congregations could hardly come into being. Indeed I need not be the first to make assurances of how much comfort and joy it would bring us and our congregations to reach such a union whereby God in his grace would extend his blessing. But most certainly this form of unification would only fulfill its purpose and be blessed if we come to a much more comprehensive understanding of each and every point of faith and confession whereby we then wish to create a unity of spirit with eachother. Such is the case as it now stands. To be precise we are still obliged to examine more closely the contents of your most generous pastoral letter of December 1, 1840 to us and we were emphatically reminded of this not only half a year ago and just a few weeks ago by Pastor Krause but also in these times we are charged by the congregations to come to an understanding with you over some points of the pastoral letter, which have not yet been addressed by us to you in the exchange of letters concerning so many different pre-existent matters. At our current group of united sessions we have made every effort to sufficiently examine your pastoral letter, as you yourself have charged us, and we ask you to accept what we have to say in this letter, written together with our dear brother in office, Walther, in accordance with the word of God and Luther's teaching, as a sign of our brotherly love and we also ask you to pass on our friendly greeting to Pastor Krause as soon as it is possible. 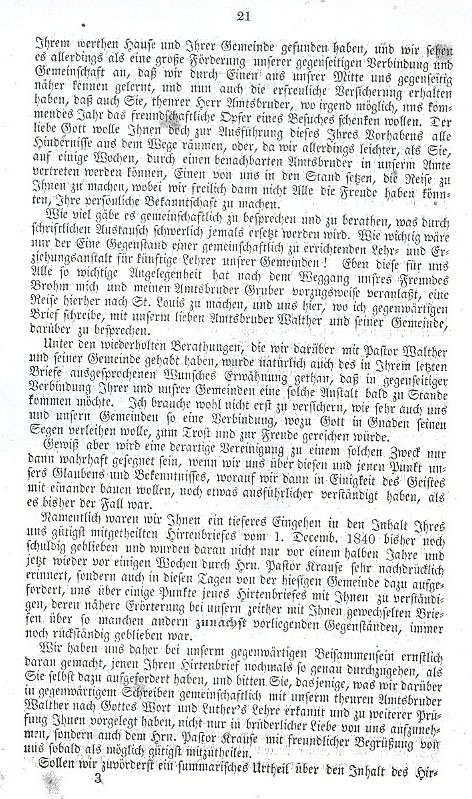 it seems to us that one section so thoroughly confuses certain raised points of old church orders, some of which are essential while others are superfluous and some divine while others are human, that Christian freedom is limited; another portion attributes more to the office of ministry than is appropriate, thus neglecting the spiritual priesthood of the congregations. 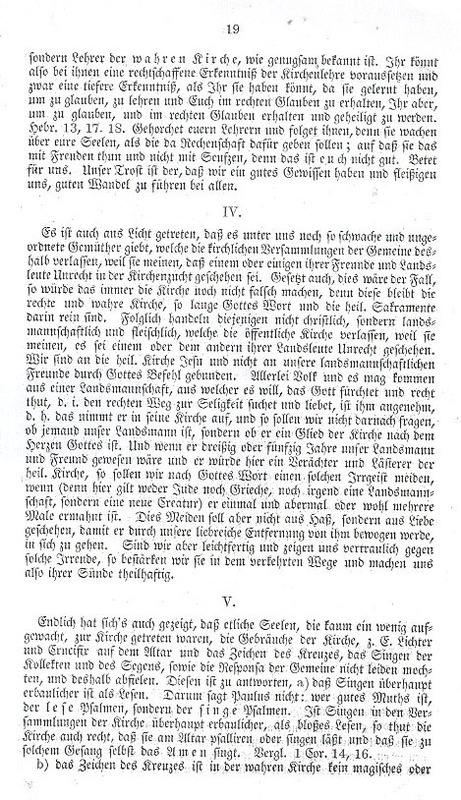 In following the order of your letter, in which you indicate the meaning of the 14th Article of the Augsburg Confession and especially in which you wish to show the meaning of rite vocatus, we are first of all struck by the mentioning of the reason for your pastoral letter being an expression of conscience, but we may have misunderstood you and therefore need not dwell on this for long. You say that the mutineers, which you have there, would acknowledge the necessity of appointment to the public teaching ministry but not to the priestly function concerning the administering of the holy sacraments.